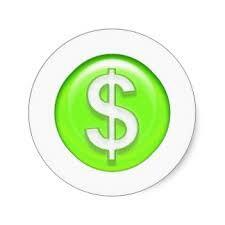 Use the Write-Off Processing window to close out a customer's account. 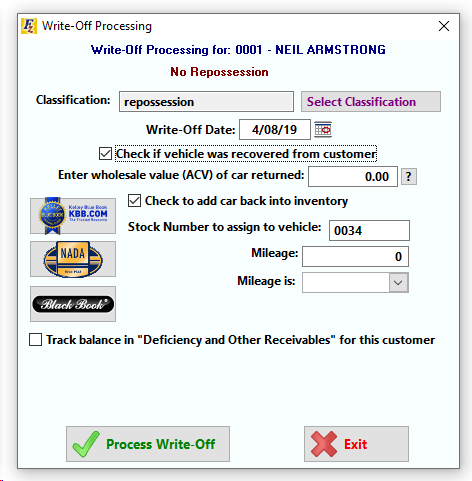 There is also an option to automatically add the customer's vehicle back to inventory. Classification is a required field, but all classifications are user-defined. The business can decide the different categories of write-offs to track. If the car was recovered, enter the wholesale value of the vehicle. This amount is subtracted from the customer's balance, ensuring a correct write-off. If the car is added back to inventory using this screen, the wholesale amount also doubles as the "original cost" of that vehicle. To repossess a vehicle before completing the write-off, exit this screen, select and then from the customer activity window.